“Drumming and Health” traveled to China (and Japan, Thailand, and Bali) April 2014 to December 2015 to develop a series of therapeutic Drum Circle programs, teach Kundalini Yoga and work as a massage practitioner. * COMMUNITY SPIRIT (you are invited) – Sat Feb 1 – North Shore Community Drum Circle at Lynn Valley United Church (ongoing monthly inter-generational Drum Circle). Info here. * COMMUNITY (you are invited!) – Sun Feb 2 – Beat Street Community Drum Circle – weekly drop-in circle until June. Everyone welcome! Info here. * CHILDREN – Mon Feb 3 – Carnarvon Preschool – young children’s music program. More info here. * HOSPITAL – Tues Feb 4 – BC Children’s Hospital – weekly and ongoing Tuesdays, School room music and Drum Circle program, and one-to-one bed side visits. * HEALTH CARE – Wed Feb 5 – InspireHealth Integrative Cancer Care – Drum Circle for LIFE Program (every two weeks). Info here. * EATING DISORDERS – Thurs Feb 6 – St. Paul’s Hospital In-Patient Eating Disorders Ward – weekly Drum Circle Program. Info and Research here. * COMMUNITY (you are invited!) – Sun Feb 9 – Beat Street Community Drum Circle – weekly drop-in circle until June. Everyone welcome! Info here. * MENTAL HEALTH (YOUTH) – Tues Feb 11 – “Balancing our Minds, Wellness Tools for Youth”, Roger’s Arena, in collaboration with the Vancouver Canucks, 1200 participants. * CHILDREN – Wed Feb 12 – Crown Preschool – young children’s music program. Info here. * COMMUNITY (DIVERSITY) – Sat Feb 15 – Immigrant Services Society of BC – Info here. * COMMUNITY (you are invited!) – Sun Feb 16 – Beat Street Community Drum Circle – weekly drop-in circle until June. Everyone welcome! Info here. * HOSPITAL – Tues Feb 17 – BC Children’s Hospital – weekly and ongoing Tuesdays, School room music and Drum Circle program, and one-to-one bed side visits. * CORRECTIONS CANADA – Tues Feb 18 – Mountain Institution – (medium security prison for men) Staff Training Session. * CHILDREN – Tues Feb 18 – 5th Richmond Brownies – Drum Circle for 140 Sparks, Brownies, Guides and Pathfinders. * HEALTH CARE – Wed Feb 19 – InspireHealth Integrative Cancer Care – Drum Circle for LIFE Program (every two weeks). Info here. * EATING DISORDERS – Thurs Feb 20 – St. Paul’s Hospital In-Patient Eating Disorders Ward – weekly Drum Circle Program. Info and Research here. * COMMUNITY SPIRIT (you are invited) – Sat Feb 22 – North Shore Community Drum Circle at Lynn Valley United Church (ongoing monthly inter-generational Drum Circle). Info here. * COMMUNITY (you are invited!) – Sun Feb 23 – Beat Street Community Drum Circle – weekly drop-in circle until June. Everyone welcome! Info here. * CHILDREN – Mon Feb 24 – 3rd Boundary Bay Beavers – Info here. * HOSPITAL – Tues Feb 25 – BC Children’s Hospital – weekly and ongoing Tuesdays, School room music and Drum Circle program, and one-to-one bed side visits. * COMMUNITY MENTAL HEALTH (YOUTH) – Wed Feb 26 – Reach Community Health Centre – weekly pilot series Youth Drum Circle Program until April. * EATING DISORDERS – Thurs Feb 27 – St. Paul’s Hospital In-Patient Eating Disorders Ward – weekly Drum Circle Program. Info and Research here. * MENTAL HEALTH WORKSHOP – Fri Feb 28 – Workshop collaboration with Victoria Pawlowski RCC – called “Mindfulness Based Compassion and Family Violence Prevention”. Since the beginning of time, drums have been utilized to celebrate, communicate, and express all that it means to be human. 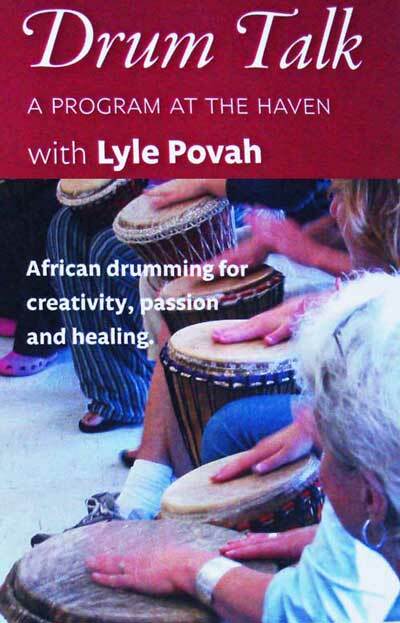 Format: This group drumming program is suited to first-timers or more experienced players, and will involve sound healing techniques, drum circle work, guided imagery with drumming, and playful rhythm games. * COMMUNITY (you are invited!) – June 2 – Beat Street Community Drum Circle – weekly drop-in circle until June 23. Everyone welcome! Info here. * CORPORATE – June 3 – Maple Ridge Parks & Leisure Services – team building session for managers. * HOSPITAL – June 4 – BC’s Children’s Hospital – weekly and ongoing Tuesdays, School room music and Drum Circle program, and one-to-one bed side visits. * HOSPITAL – June 5 – St. Paul’s Hospital In-Patient Eating Disorders Program (every 2 weeks, ongoing Wednesdays) – Drum Circle Program and Research study. Info and Research here. * COMMUNITY (you are invited!) – June 9 – Beat Street Community Drum Circle – weekly drop-in circle until June 23. Everyone welcome! Info here. * HOSPITAL – June 11 – BC’s Children’s Hospital – weekly and ongoing Tuesdays, School room music and Drum Circle program, and one-to-one bed side visits. * HEALTH CARE – June 12 – Inspire Health Integrative Cancer Care – (every 2 weeks, ongoing Wednesdays) – Drum Circle session for the Life Program, for those newly diagnosed with cancer, their families and loved ones. * COMMUNITY (you are invited!) – June 16 – Beat Street Community Drum Circle – weekly drop-in circle until June 23. Everyone welcome! Info here. * HOSPITAL – June 19 – St. Paul’s Hospital In-Patient Eating Disorders Program (every 2 weeks, ongoing Wednesdays) – Drum Circle Program and Research study. Info and Research here. * COMMUNITY – June 20 – Thompson Community Centre, Richmond – Summer Community Picnic Celebration for families, inter-generational Community Drum Circle. * COMMUNITY HEALTH CARE – June 21 – Positive Living Society – a Drum Circle Celebration for persons living with HIV/AIDS, Loon Lake Research & Education Centre. * COMMUNITY SPIRIT (you are invited) – June 22 – North Shore Community Drum Circle at Lynn Valley United Church (last Saturday of each month ongoing, re-starts after Summer break on Sept 22), inter-generational Drum Circle. Info here. * COMMUNITY (you are invited!) – June 23, last circle of our 18th year, re-starts after Summer break on Sept 22 – Beat Street Community Drum Circle – . Everyone welcome! Info here. * HOSPITAL – June 25 – BC’s Children’s Hospital – weekly and ongoing Tuesdays, School room music and Drum Circle program, and one-to-one bed side visits. * HEALTH CARE – June 26 – Inspire Health Integrative Cancer Care – (every 2 weeks, ongoing Wednesdays) – Drum Circle session for the Life Program, for those newly diagnosed with cancer, their families and loved ones. * HEALING – June 27 – Sound and Wellness Sessions – private sessions using crystal bowls, tuning forks, toning and massage for wellness. * HEALTH CARE – May 1 – Inspire Health Integrative Cancer Care – (every 2 weeks, ongoing Wednesdays) – Drum Circle session for the Life Program, for those newly diagnosed with cancer, their families and loved ones. * CORPORATE – May 2 & 3 – BC Recreation & Parks Association – workshop titled “African Drumming – Boosting Health and Community Spirit through Rhythm”and Closing Ceremomy, Whistler BC. * COMMUNITY (you are invited!) – May 5 – Beat Street Community Drum Circle – weekly drop-in circle until June 23. Everyone welcome! Info here. * HOSPITAL – May 7 – BC’s Children’s Hospital – weekly and ongoing Tuesdays, School room music and Drum Circle program, and one-to-one bed side visits. * COMMUNITY – May 8 – Vancouver Community College – Mental Health Awareness Day, opening ceremony Drum Circle and workshop series. * HEALTH CARE – May 15 – Inspire Health Integrative Cancer Care – (every 2 weeks, ongoing Wednesdays) – Drum Circle session for the Life Program. * HEALING – May 16 – Sound and Wellness Sessions – private sessions using crystal bowls, tuning forks, toning and massage for wellness. * COMMUNITY (you are invited!) – May 19 – Beat Street Community Drum Circle – weekly drop-in circle until June 23. Everyone welcome! Info here. * HOSPITAL – April 22 – St. Paul’s Hospital In-Patient Eating Disorders Program (every 2 weeks, ongoing Wednesdays) – Drum Circle Program and Research study. Info and Research here. * CORPORATE – May 24 – nTrust Financial – Team building session for managers and staff. * COMMUNITY SPIRIT AND CELEBRATION – (you are invited) – May 25 – Lynn Valley Days – at Lynn Valley United Church, inter-generational Drum Circle. Info here. * COMMUNITY (you are invited!) – May 26 – Beat Street Community Drum Circle – weekly drop-in circle until June 23. Everyone welcome! Info here. * HEALTH CARE – May 29 – Inspire Health Integrative Cancer Care – (every 2 weeks, ongoing Wednesdays) – Drum Circle session for the Life Program. * CORPORATE – May 29 – UBC Sauder School of Business – team building session titled “Energizing your Leadership” for the executive development program “Meeting the Leadership Challenge”. * HEALTH CARE – May 31 – Specialized Eating Disorders Program – Children’s Hospital – Drum Circle program for youth. * HEALTH CARE – May 31 – Child Psychiatry – Children’s Hospital – Drumming and recreational music program for children. * HOSPITAL – April 2 – BC’s Children’s Hospital – weekly and ongoing Tuesdays, School room music and Drum Circle program, and one-to-one bed side visits. * PRESENTATION – April 2 – Pecha Kucha – Lyle speaks about the work and his research at this presentation and performance evening at the Evergreen Cultural Centre Theatre. Info here. * CHILDREN – April 3 – Crown and Tom Thumb Preschools – drum fun and music. * HEALTH CARE – April 3 & 17 – Inspire Health Integrative Cancer Care (every 2 weeks, ongoing Wednesdays) – Drum Circle session for the Life Program, for those newly diagnosed with cancer, their families and loved ones. * HEALING – April 4 – Sound and Wellness Sessions – private sessions using crystal bowls, tuning forks, toning and massage for wellness. * INTER-CULTURAL – April 9 – Japanese Language Group – yearly Spring Drum Circle session, visiting from Japan. * HOSPITAL – April 10 – St. Paul’s Hospital In-Patient Eating Disorders Program (every 2 weeks, ongoing Wednesdays) – Drum Circle Program and Research study. Info and Research here. * COMMUNITY (you are invited!) – April 13 – ArtWalk Festival – Drumming and Health is at the ArtWalk Festival in Port Moody, Drum Circle from 2 – 3 p.m. and Grand Finale 4 – 5:30. Info here. * COMMUNITY (you are invited!) – April 14 – Beat Street Community Drum Circle – restarts weekly drop-in circle until June (no circle May 12). Everyone welcome! Info here. * CHILDREN – April 15 – Carnarvon Preschool – more drum fun and music. * CORRECTIONS – April 19 – Mountain Institution – medium security prison for men in Agassiz, Drum Circle for inmates. * COMMUNITY (you are invited!) – April 21 – City of Richmond Earth Day – celebrations at Garden City Community Park. Info here. * COMMUNITY (you are invited!) – April 21 – Beat Street Community Drum Circle – weekly drop-in circle until June Info here. * HOSPITAL – April 24 – St. Paul’s Hospital In-Patient Eating Disorders Program (every 2 weeks, ongoing Wednesdays) – Drum Circle Program and Research study. Info and Research here. * SCHOOLS – April 25 – Highlands Elementary School – Community Drum Circle for the whole school to celebrate Earth Day. * TEAM BUILDING WITH HEALTH SERVICES – April 26 – Abbotsford Community Services Staff Day – Team building Drum Circle session for 175 health services staff. * COMMUNITY SPIRIT (you are invited) – April 27 – North Shore Community Drum Circle at Lynn Valley United Church (last Saturday of each month ongoing), inter-generational Drum Circle. Info here. * COMMUNITY (you are invited!) – April 28 – Beat Street Community Drum Circle – weekly drop-in circle until June Info here. * COMMUNITY (You are invited!) – Beat Street Community Drum Circle – Drop-in Sundays 3 – 5 p.m. until June >> NOTICE – No circles April 7 and May 12. Info here. * HOSPITAL – February 5 – BC’s Children’s Hospital (weekly and ongoing Tuesdays) – School room music and Drum Circle program, and one-to-one bed side visits. * HEALTH CARE – February 6 – Inspire Health Integrative Cancer Care (every 2 weeks, ongoing Wednesdays) – Drum Circle session for the Life Program, for those newly diagnosed with cancer, their families and loved ones. * DRUMMING AND HEALTH – February 7 – Department of Justice Wellness Fair – Drum Circle experience and education. * TEACHING – February 11 – Private lessons. * HOSPITAL – February 13 – St. Paul’s Hospital In-Patient Eating Disorders Program (every 2 weeks, ongoing Wednesdays) – Drum Circle Program and Research study. Info and Research here. * SCHOOLS – February 15 – Tomekichi Homma Elementary School – all day Drum Circle program featuring the rhythms and culture of Ghana, West Africa. * COMMUNITY SPIRIT (you are invited) – February 23 – North Shore Community Drum Circle at Lynn Valley United Church (last Saturday of each month ongoing) – inter-generational Drum Circle. Info here. * CORRECTIONS/RESTORATIVE JUSTICE – February 26 – Kent Institution (maximum security prison for men) – Drum Circle session. * HEALTH CARE – March 1 – Vancouver Coastal Health’s Better Breathers Education and Support Group – “All for Drum and Drum for All – a Dynamic Prescription for Wellness”, Drum Circle program to support health. * COMMUNITY/EDUCATION – March 2 – Dress For Success Vancouver – keynote speaker engagement and Drum Circle program for Professional Women’s Alumni Group. Info here. * MENTAL HEALTH – March 8 – Maples Adolescent Treatment Centre – Drum Circle program for youth and staff. * SPECIAL POPULATIONS – March 16 – North Shore Disability Resource Centre – Drum Circle for Teen Program. Info here. * COMMUNITY (you are invited) – March 16 – Night Quest – Drum Circle for all ages, 7 – 10 p.m., Pacific Spirit Regional Park, 16th Ave park entrance (400m west of Blanca). Info here. * HEALING – March 18 – Sound and Wellness Sessions – private sessions using crystal bowls, tuning forks, toning and massage for wellness. * HEALTH CARE – March 20 – Inspire Health Integrative Cancer Care(every 2 weeks, ongoing Wednesdays) – Drum Circle session for the Life Program, for those newly diagnosed with cancer, their families and loved ones. * COMMUNITY SPIRIT (you are invited) – March 23 – North Shore Community Drum Circle at Lynn Valley United Church (last Saturday of each month ongoing) – inter-generational Drum Circle. Info here. * HOSPITAL – March 26 – BC’s Children’s Hospital (weekly and ongoing Tuesdays) – School room music and Drum Circle program, and one-to-one bed side visits. * HOSPITAL – March 27 – St. Paul’s Hospital In-Patient Eating Disorders Program (every 2 weeks, ongoing Wednesdays) – Drum Circle Program and Research study. Info and Research here. * EASTER INTER-GENERATIONAL COMMUNITY RETREAT (you are invited) – March 29 -31 (Easter Weekend) – Drum Talk for Families – New program at the Haven on Gabriola Island! Music and drumming to bring the generations together. Info here.